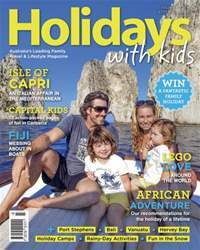 Welcome to the winter edition of Holidays with Kids filled with ideas sure to warm imaginations when thinking up a future family getaway. This issue we venture far and wide, from sunshine-filled destinations like Capri, Africa, Fiji and Hawaii, to a chilly spot of fun in Jindabyne. We check in to Club Med in Malaysia for some family exploring, while closer to home we venture to Canberra, Macarthur, Melbourne and the Sunshine Coast. Do you have a miniature foodie in the family? Then be inspired by our article on how to get kids loving all manner of international cuisine. Or – for those wanting some plastic fantastic action – check out what’s on offer at the various LEGOLANDs around the world. With the latest family travel information, tips and ideas, there’s plenty to keep minds busy!